The Highlights of Antarctica Cruise is the perfect option for travelers wanting to see the best of Antarctica in just one week, or for those who tend to get sea sick. You will begin your tour with a welcome dinner in Punta Arenas, Chile, before taking a flight to the South Shetland Islands, bypassing the choppy waters of the Drake Passage and Cape Horn. From the wind-swept islands you will embark on an once-in-a-lifetime Antarctica cruise to fully experience the wonders of this continent. Antarctica is a vast, virtually untouched continent where nature reigns. When the luxurious cruise turns off its engines, the blissful sounds of nature fill the air: wildlife, water, and the occasional boom of icebergs calving. While there are only a few native species that call Antarctica home, those that can overcome the harsh environment thrive in large numbers. Among the highlights for visitors are orcas, blue whales, seals, squids and penguins. Upon arrival to Punta Arenas you will be met by one of our representatives and taken to your confirmed hotel in Punta Arenas. In the afternoon, you will meet your fellow expedition mates and receive information about your Antarctica cruise. Later you will enjoy a delicious welcome dinner with your team at the José Nogueira Hotel, a splendid French-style mansion that is over one 100 years old. 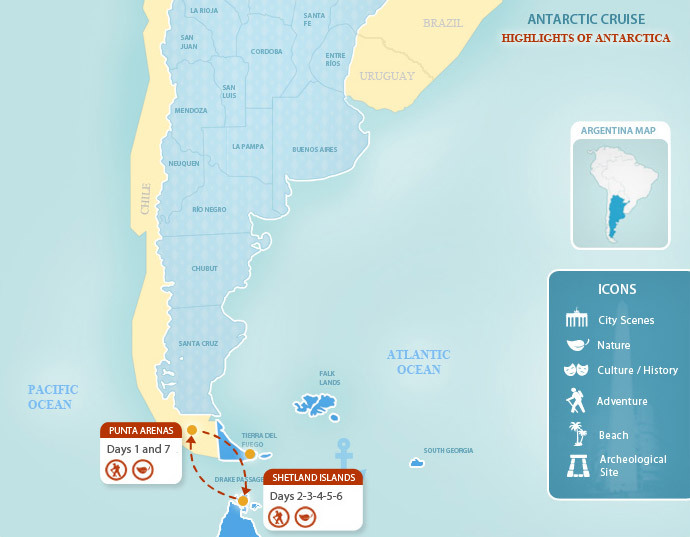 Your Antarctica adventure will begin with an 1.5 hour flight from Punta Arenas to King George Island (South Shetland Islands). You will fly over the Drake Passage to reach the Antarctica. The passage is known for its rough waters, so flying - rather than taking a boat - is an ideal alternative, especially for those who are prone to motion sickness. Upon arrival, you will be taken on a tour of the Frei Chilean Base and the Bellingshausen Russian Base. Later on, you will embark on the Ocean Nova ship from Fildes Bay to begin your thrilling quest to Antarctica. Enjoy the company of sea birds, seals, whales, and penguins as you cruise between the South Shetland Islands and the western coast of the Antarctic Peninsula. This incredible journey southwards includes visits to some of the most thrilling spots on the isolated continent, such as Livingston Island, Port Lockroy, Paradise Bay, Petermann Island, Cuverville, and Deception Islands, amongst others Antarctica highlights. This lively cruise includes several daily landings, lectures, and fun-filled activities on board. The target destination is the crossing of the Lemaire Channel at the latitude 65 degrees south. After four days of exploration, disembark the cruise ship at the Frei Chilean Base. From there you will continue on to the aerodrome for the flight over the Drake Passage back to Punta Arenas. A transfer will take you to your hotel in Punta Arenas. Enjoy the rest of the evening at your leisure. After breakfast, a transfer will meet you at your hotel and take you to the airport for your journey home or on to your next destination. Alternatively, choose one of our exciting Argentina excursions and extend your vacation. Built to face the icy and rough waters of the Antarctic, the stylish Yugoslavian-designed Sea Adventurer boasts 57 comfortable cabins with exterior views and modern amenities. The ice-strengthened hull of the 117-passenger ship enables it to sail and park in remote and unattainable locations. Onboard features include a multi-purpose lounge, exercise room, and window-lined dining room ideal for admiring the breathtaking landscapes.